This post from @femtoduino got me thinking about a slide I saw earlier this morning by Tom Whitwell. From time to time we’ve had clones of other projects appear on Tindie. Usually the seller hasn’t followed an open source license. We then reach out to the offending seller and either the seller follows the original license or we pull the product. As I was thinking about this today, I was also further reading on Shanzhai and how hardware is made in China, and Shenzhen to be more specific. 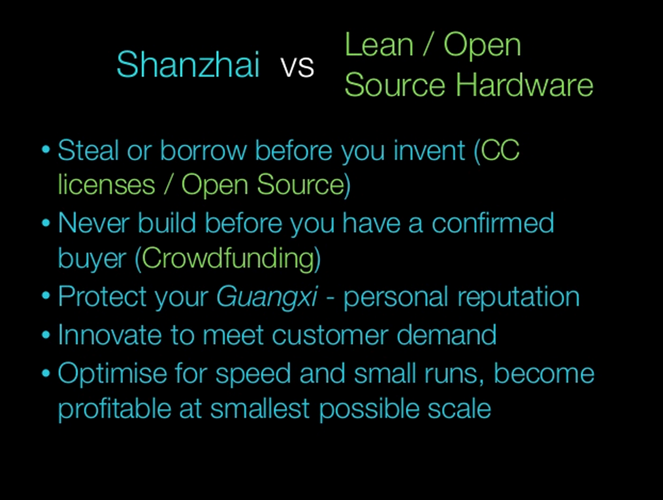 Shanzhai goes counter to much of how the west develops hardware. As more and more sellers on Tindie come from China, Tindie is becoming a focal point for these 2 converging philosophies. A bunch of questions arise from that convergence - does one win over the other? Can they live together? What do you all think? It boils down to being either honest or dishonest business entrepreneurs. Some folks believe in doing business, regardless of honesty. Do whatever it takes, survival of the fittest, as they say. Others, such as some of us on tindie, believe in responsible business conduct - Do whatever it takes, but within reason. We all share the same finite resources on this planet, and we need to treat each other with loving kindness in order to prosper. Without collaboration, no one really wins. If a “borrowed” design improves upon it predecessor, then it essentially becomes a new product and can not be considered stealing. However, I see items coming from China that are plain ripoffs. In my field of ultrasonic cleaners, China is selling (40khz) ultrasonic cleaners at an impossibly low price - in my opinion, it is an unfair tactic to shut out American (and other countries) manufacturers - to essentially put them out of business - then China will inflate the price to recover their losses. Never build before you have a confirmed buyer, I believe needs clarification: Never build and stockpile merchandise before you have a market. I did this for my first invention- an emf detector with a frequency readout. I sold two in five years, but have inventory to make 100. Innovate to meet customer demand - I got (and still get) messages from customers about what they want and need. Customer feedback is why I added 80khz Ultrasonic systems and discontinued the 40khz systems. I am also consulting on some other projects. Optimize for speed and small runs! Buy only the supplies you need to meet demand. I made the mistake of over-ordering parts in anticipation of sales, only to have my bank account drain. Now, I buy parts as I need them, and just enough to complete those orders. Keeps more money in the bank.